Louis Leterrier reveals to the LA Times that he is under contract for one more film at Marvel Studios. He said, "I am contracted to do one more film with Marvel so when I’m done here with this I will go back to say to them, “Guys you need me? Is there something I can do?”" With Leterrier showing interest and also being obligated to one more film, rumors can begin to swirl on just what property would Leterrier like to tackle next. Would he want another shot at the Hulk or perhaps another Marvel hero? Talking about his Hulk film and the prospect of another Leterrier said, "I did my Hulk but it was not easy. If I do another Hulk film it will always be compared to the Ang Lee thing, and my first one … if I come back I’d love to do another superhero, something different that I can really put my touch on." So if Leterrier doesn't want to do another Hulk film what exactly would he want to do? He tells the LA Times, "Well frankly I’d love to do the Avengers. But there are so many great ones in the Marvel world." Louis Leterrier continued his vocal interest in The Avengers by saying, "I would love to do the Avengers film. I’d love to work with Marvel again. I loved working with them. I like Kevin Feige, he’s a good guy and a fan. I love him. I feel really good at Marvel because they are people my age who are obsessed with movies and comic books." While Leterrier does do some nice puckering up for "The Avengers", we also know that Jon Favreau will push for the job. Luis Leterrier also expresses a unique idea he has for "The Avengers" film that would allow for each of the current Marvel directors to be apart of the superhero team-up film. Leterrier explained, "You know, you asked about my dream, I’ll tell you my real dream: To work with Joe Johnston and [“Thor” director] Kenneth Branagh and Jon Favreau and make like a triptych. We do four movies. We release them one a month for the summer." Wow, that sounds nuts, Essentially each director would have they own story which combines for one huge film. Leterrier explained his dream further. He said, "So we do it the way they make television shows. One story arc but told in installments by different directors. So all of the directors that touch part of the Avengers world would do a part; we could make the movies shorter, maybe less than an hour and a half, and we use the same sets and save Marvel money." Sounds like an idea that has potential to shake up the way comic films are made, but would Marvel bite at this interesting idea. Leterrier closed his comments on pushing his Avengers pitch by saying, "I would love to sit around a table with all of them a kick around the story. That’s my dream." 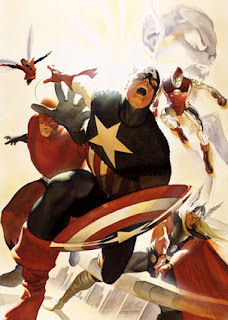 Leterrier also told the LA Times a little bit about Joe Johnston's "First Avenger: Captain America" in which he joked that his paasport would've been burned if the French director helmed a Captain America film. Leterrier describes what he saw of Captain America, "I have seen some of the design work they’re doing for Captain America and it looks amazing. It’s a period piece and it’s like “Raiders of the Lost Ark” and with more gadgets..." He added, "It’s “Raiders” meets "Rocketeer” and “Saving Private Ryan.” It’s going to be so cool." Leterrier's words only increase my intrigue on one of my all-time favorite Marvel heroes! More news on the various Marvel fronts as they develop. Read the full LA Times interview here.